RICHMOND, Va. — The large-scale development of wind power off the Mid-Atlantic coast would create more than 70,000 jobs from New York to Virginia, an industry-sponsored study concludes. The study released Wednesday said those jobs would be created by a new industrial base needed to manufacture, build, operate and maintain the towering wind turbines, and an additional 40,000 jobs would be needed to serve the supply chain. The job growth would be realized over a 10-year build out of the offshore industry. The study was conducted for the Atlantic Wind Connection and released during the American Wind Energy Association’s annual conference in Virginia Beach. It continues through Thursday. “These findings highlight the unique opportunity our nation has for stimulating a brand new industry by developing this limitless, yet untapped, resource,” said Bob Mitchell, CEO of Atlantic Wind Connection.Backed by the Internet titan Google and other investors, the Atlantic Wind Connection is moving forward with the construction of a 380-mile power line that would enable up to 7,000 megawatts of electricity to be produced at offshore wind farms from Virginia to New Jersey. The study’s economic projections are based on the development of 7,000 megawatts of wind power, or enough to power more than 2 million homes in the Mid-Atlantic region. Besides the 110,000 jobs created directly by the industry and the supply chain, the study estimates that 50,000 jobs would be created by the effect of added economic activity — restaurants and groceries, for instance. Large-scale wind development off the Atlantic coast would also have a combined economic impact for the states of $19 billion and increase local, state and federal government revenues by $4.6 billion, the study by information and analytics company IHS Inc. concluded. Mitchell said the findings represent the “tip of the iceberg” of an industry that could have the potential of generating 330 gigawatts of electricity, exceeding the region’s current energy use. He cited a University of Delaware study that examined wind potential from Cape Cod in Massachusetts to North Carolina’s Outer Banks. 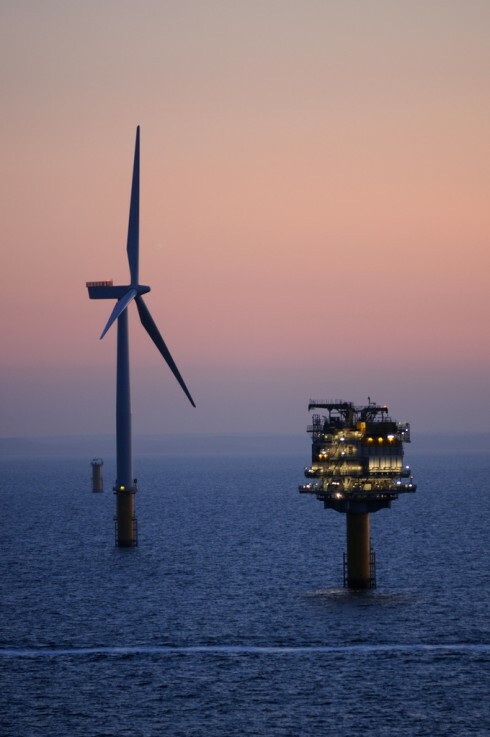 The study, of course, examines the potential for an industry that has little presence in the in the U.S.
No commercial wind power is produced in waters off the U.S., although a project off Cape Cod, Mass., could begin producing electricity in 2014. In Virginia, the industry is just beginning to stir with eight energy producers expressing interest in developing ocean bottom 25 miles off Virginia Beach. The state is seeking to survey the ocean bottom and collect surface data to move the industry forward. Wind power advocates have said Virginia is uniquely positioned to nurture the industry because of the relatively shallow waters offshore and strong winds. It also has the coastal infrastructure — a shipbuilding industry and a deepwater port — to allow for building and delivering turbines.